Third-century archdeacon of Rome, distributor of alms, and "keeper of the treasures of the church" in a time when Christianity was outlawed. On 6 August 258, by decree of Emperor Valerian, Pope Saint Sixtus II and six deacons were beheaded, leaving Lawrence as the ranking Church official in Rome. While in prison awaiting execution Sixtus reassured Lawrence that he was not being left behind; they would be reunited in four days. Lawrence saw this time as an opportunity to disperse the material wealth of the church before the Roman authorities could lay their hands on it. On 10 August Lawrence was commanded to appear for his execution, and to bring along the treasure with which he had been entrusted by the pope. When he arrived, the archdeacon was accompanied by a multitude of Rome's crippled, blind, sick, and indigent. He announced that these were the true treasures of the Church. Martyr. Lawrence's care for the poor, the ill, and the neglected have led to his patronage of them. His work to save the material wealth of the Church, including its documents, brought librarians and those in related fields to see him as a patron, and to ask for his intercession. And his incredible strength and courage when being grilled to death led to his patronage of cooks and those who work in or supply things to the kitchen. The meteor shower that follows the passage of the Swift-Tuttle comet was known in the middle ages as the "burning tears of Saint Lawrence" because they appear at the same time as Lawrence's feast. Our Lord hath this day clothed His soldier, Laurence. More cheerfully than they have heretofore. And shrank not from offering his limbs to punishments most grievous. And settlement is made upon the Church's hidden holdings. By the torments of the ruler's avarice. Giveth to the gathered poor. Giving them abundance from his means. And a glowing bed made ready. But he laugheth it to scorn. Who struggle for the sake of Christ. Against the lackeys of wickedness. And generous with their blood. Thou didst scorn the emblems of the Caesar, and laugh the judge's threats to scorn. It is in vain the pyre's burning thy gridiron doth enfold. Conquered by a broiled fish - the food of Christ. Rising again with Him, filled to the full with Christ. O martyr and mighty foot-soldier! The Roman Church commends to us today the anniversary of the triumph of Saint Lawrence. For on this day he trod the furious pagan world underfoot and flung aside its allurements, and so gained victory over Satan's attack on his faith. As you have often heard, Lawrence was a deacon of the Church at Rome. There he ministered the sacred blood of Christ; there for the sake of Christ's name he poured out his own blood. Saint John the apostle was evidently teaching us about the mystery of the Lord's supper when he wrote: "Just as Christ laid down his life for us, so we ought to lay down our lives for the brethren." My brethren, Lawrence understood this and, understanding, he acted on it. In his life he loved Christ; in his death he followed in his footsteps. Brethren, we too must imitate Christ if we truly love him. We shall not be able to render better return on that love than by modeling our lives on his. "Christ suffered for us, leaving us an example, that we should follow in his steps." The holy martyrs followed Christ even to shedding their life's blood, even to reproducing the very likeness of his passion. They followed him, but not they alone. It is not true that the bridge was broken after the martyrs crossed; nor is it true that after they had drunk from it, the fountain of eternal life dried up. On no account may any class of people despair, thinking that God has not called them. Christ suffered for all. What the Scriptures say of him is true: "He desires all men to be saved and to come to knowledge of the truth." Born to the Portugese nobility, the youngest of eleven children of Rui Gomes, the Count of Viana, and Isabel de Menezes; brother of Saint Beatrice da Silva Meneses. Courtier to Empress Eleonaora of Portugal. Married briefly. Monk at the Hieronymite monastery of Santa María de Guadalupe for ten years. Entered the Franciscans in 1453 in Assisi, Italy as a lay brother. Hermit. Ordained in 1459. Founded the monastery Virgin of Peace near Milan, Italy and led a community under strict Franciscan rules; they were known as the Amadeistene, Amadeeërs or Marignano reform, and at one point there were 28 houses following their example, but all eventually merged with the Franciscans. Wrote on prophesy, and a commentary on the Book of Revelations. Amadeus's work was praised by Pope Sixtus IV, King Ferdinand the Catholic of Aragon, and Saint Louis IX of France. Soldier of the Theban Legion. Convert to Christianity. He escaped the massacre of the Legion and became an evangelist in the mountain district of Val Soana. Reported to be a miracle worker and able to heal by prayer. Martyr. Because of the understandably poor records from the period, and the similarity of his name both to other evangelists in the region and to a pre-Christian god, Bessus has figured into a lot of folk tales, practices and later legends. • soldier holding a banner reading "ICTUS"
Born to the nobility. Known as a quiet and pious child, it was no surprise when he went to live as a hermit in a cave near the church of Santa Maria dei Giubino in Sicily. His reputation for holiness spread, and the young hermit attracted would-be spiritual students - which caused him to move to Alcamo, Sicily to get away from them. His reputation went with him, and he was asked to restore broken down shelters for the poor in the area. The job finished, Arcangelo returned to his hermitage. However, Pope Martin V, working to restore papal authority, decreed that all hermits in Sicily should join approved religious orders; and so Arcanglo joined the Franciscans in Palermo, receiving the habit from Blessed Matthew of Girgenti. Priest. Assigned to establish a new Franciscan house in Alcamo; he used part of the structures he had helped to restore. 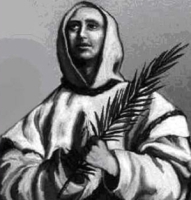 He led both his brothers and the laity by his example, supported Franciscans throughout Sicily, turned down the bishopric in Alcamo, and spent his last days helping Blessed Matthew. Nephew of Saint Cathan. Studied in Ireland under Saint Comgall of Bangor, Saint Kenneth, and Saint Canice. Monk. After seven years, he returned to Scotland; tradition says he travelled in a boat without oars or rudder, but that it took him safely home. Monk at the monstery founded by Cathan; ordained by his uncle. Missionary to the Scottish Picts. Bishop of Kingarth, Scotland, ordained by Cathen. Pilgrim to Rome to seek papal blessing on his bishopric; made the return trip entirely on foot. Reputed miracle worker, including bringing the young son of a British chief back to life, curing the blind, and lighting fire by making small bolts of lightning jump between his fingers. Devotion to Blane soon followed his death, was widespread in Scotland, and very popular; his monastery became the site of the cathedral of Dunblane, Scotland and there were several churches with his name. Joined the Carthusians on 18 December 1769 at the monastery of Fontenay, France. Priest. Served as vicar of his house until June 1791 when the monastery was suppressed by the civil authorities of the French Revolution. Arrested on 19 April 1793 for refusing to take the oath that would have switched his allegience from the Vatican to the civil authorities of the Revolution. Imprisoned on a ship in the harbor of Rochefort, France and left to die. There he ministered to other prisoners, hearing confessions, doing what little he could for the sick. 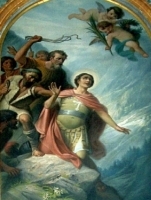 One of the Martyrs of the Hulks of Rochefort. Orionist friar. After studies at the mother-house in Tortona, Italy, he was ordained on 6 June 1936. Returning to Poland, he taught at the college of Zdunska Wola. Parish priest in Wloclawek, Poland. Arrested on 7 November 1939 and condemned to forced labour at the Dachau concentration camp farms during the Nazi persecutions; he kept consecrated hosts in a small box he wore around his neck, and spent his time in the fields in Eucharistic adoration. Martyr. Priest in the diocese of Wloclawek, Poland. Imprisoned and murdered in the Nazi persecutions. Martyr. Worked as a catechist, helping Jesuit missionaries. Imprisoned at Ikinoshima for his faith. While imprisoned, he was received into the Jesuits. Martyr. King of Damnonia (in modern Devon, England). He and his wife Enid are the subjects of romantic legends in the region. Sister of Saint Grata of Bergamo. Worked to provide Christian burial for martyrs. Executed by Diocletian for doing it. Martyr. Related to Saint Ebrigisil, Saint Ado of Jouarre, and Saint Agilbert of Paris. Nun. Abbess of Jouarre Abbey c.660. Nephew of Saint Hugh of Cluny, who was his teacher and spiritual director. Benedictine monk at Cluny Abbey in France. Bishop of Auxerre, France in 1096. Poor layman shoemaker in sixth-century Rome, Italy. Pope Saint Gregory the Great wrote that every Saturday Deusdedit would give away all the profits from that week to the poor. I have no details on this saint. A large number of Christians who died in Alexandria, Egypt between 260 and 267 in the persecutions of Decius and Valerian, whose names have not come down to us, and who are commemorated together. Group of 165 Christians martyred in the persecutions of Aurelian.